Welcome to Mirasol – a private, gated, country club that is a is a five-time member of the prestigious group of Platinum Clubs of America. It is also recognized as a Distinguished Emerald Club of the World by The BoardRoom Magazine. Whether you are a golf enthusiast, a fitness buff, a sports lover or focused on family, brace yourself and click here to read on to know more about the top notch and world class amenities that the The Country Club at Mirasol presents. There are 25 subdivisions in Mirasol, built on 2300 acres of prime lots. Each subdivision has single family homes and luxurious villas. The number of bedrooms range from 3 to 6 and they occupy a maximum of 7,000 square feet. Homes have been designed with a Mediterranean-inspired architecture and world class amenities. 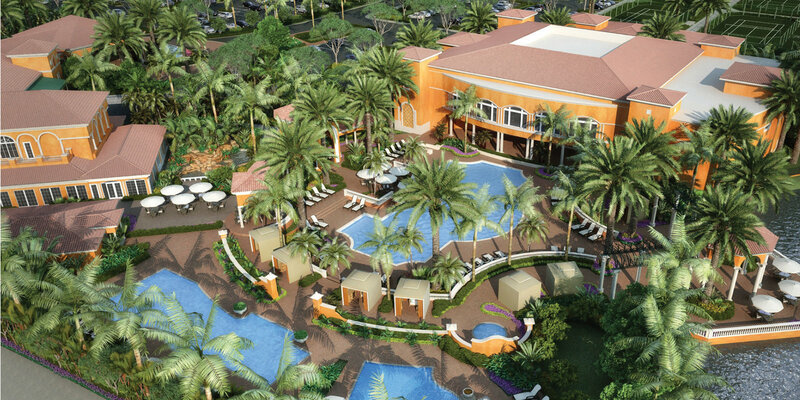 Come and see what the Country Club at Mirasol has to offer! First stop is the golf course. These golf courses were designed by revered designers, Tom Fazio and Arthur Hills. Offering 36 holes of golf, Mirasol has proudly hosted the PGA Tour’s Honda Classic multiple times. There are various tee areas at the Sunset Course, which plays from the length of 5,168 to 7,192 yards. It’s neighbor, the Sunrise Course, aslo offers multiple tee areas and plays from 5,173 to 7,332 yards in length. Practice facilities offer state of the art technology to support golfers in fine tuning their game. The courses are adorned by the 75,000 square foot clubhouse which houses the Solstice, a one of kind fine dining experience, The Upstairs Bar and Lounge, The Esplanade Spa and Fitness Center offering pilates and spin studios and a spa that gives patrons a sense of tranquility like no other. In addition, the community boasts an aquatics complex and tennis center.